One of the things I really loved about our recent vacation is that the resort had tons of activities scheduled throughout the week. There wasn’t time to do everything (like making candles or salt scrubs, taking a cooking class, or playing Wii), but we sure loved the things that we got to do. 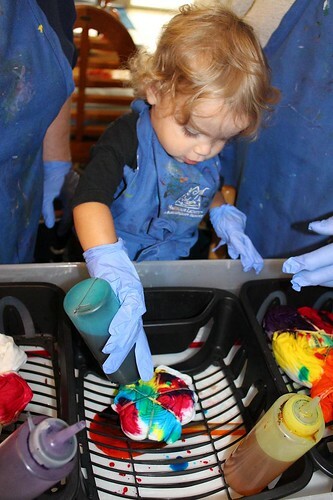 Our ‘lil artist had a great time dying his tie dye shirt, the giggles! We didn’t realize that we’d have to wait 24 hours for the dye to soak into the shirts and then rinse, wash, and dry them, but they were ready to go just before we headed out. This was perfect timing for us to snap a photo in front of the resort at what Arianna called “The Lightning House”. 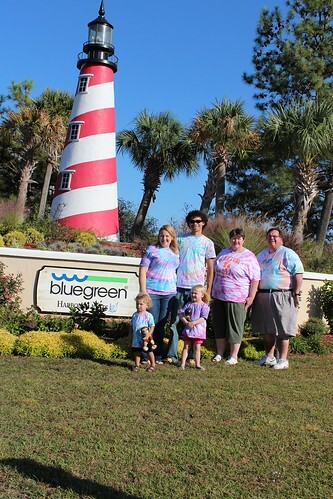 This entry was posted in Arianna, Becky, Evan, Greg, Vacations and tagged Bluegreen, Harbour Lights, Myrtle Beach, Tie Dye. Bookmark the permalink. this is so adorable. i love the tie dye family pic.